Next year, we're going to come back here and run this thing in 4 hours Tony said. I said ,yeah, I'm sure we can do that if we just leave out that out and back spur on the Cedar Ridge Trail from mile 21 to 24. This was my 4th time running this race. I missed the 2nd year because I waited too late to sign up but I did volunteer that year. And for the 4th time I had a bad race. 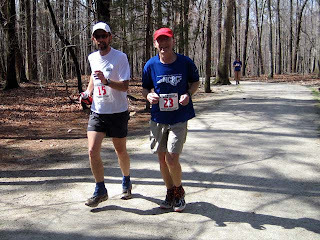 For the 3rd year in a row I had my frequent trail companion Tony Rouse along for the fun. It seems funny how both of us find a way to fall apart at this race. Two years ago we could blame the unseasonably hot weather. Last year we went out way to hard, but this year we couldn't come up with an explanation. I guess it's just a hard race but you would think maybe we could feel good just one time. I really didn't know how I wanted to run this year and really only made up my mind the night before the race. I decided I would go out easy for the first couple of miles and see how I felt. If I felt great I'd go for a fast time. If I just felt OK, then I would continue to run easy and call it a workout in preparation for the upcoming 100 in April. I arrived at Camp Lapihio about 45 minutes before the race and carried my bag inside and went to check in. That took a while because of seeing so many friends to greet. That is one of the great attractions of this local race . I was very happy to see my great friend Margo, as soon as I entered the lodge. This is where I first met her 3 years ago. My friend Jerry had told me about this this amazing Italian Marathon Lady and I recognized her from his description as we ran along in the first mile. I introduced myself and I'm sure she must have thought I was a bit strange as she quickly pulled away. Since that day she has become one of my dearest friends and has played a big part in my becoming a more social person instead of the former hermit of a few years ago. Thats her with the black leggings waiting in the potty line with the Ever Lovely Mrs. Doom and Marie behind her. Finally it was time to start so everyone gathered outside and suddenly 5 minutes before the start a thunderstorm passed over soaking us all. Fortunately it wasn't cold and the rain stopped by the time we reached the 1st mile. I was cruising along easily and chatting with Doom, Mark Long, and Mike Day. By mile 2 they begin to pull away and I was not ready to push the pace yet. I was waiting to see how I felt once we hit the single- track. Tony caught up to me just as I started onto the Company Mill Trail and we began our usual race chatter. No one else has come close to running as many miles in trail races and ultra's with me than Tony. And the funny thing is we have never planned on running one together. It just seems at some point we seem to find one another and our paces are very similar. Some days he pulls ahead, some days I'm feeling better and then days like today we end up running to the finish. I've lost count of the number of times we have tied at the end. So as we ran down the hill to the creek bottom, I was tempted to pass some slower runners but held back still waiting since we still had 23 miles to go. As we came to the first climb it became obvious to me that I would not be breaking 4 ours today. Margo caught up to us and I introduced her and Tony. I was really enjoying the single-track sections. The rain from the day before and the morning had the trails nice and wet with mud and standing water. It wasn't the yucky, sticky kind of mud though. Just the fun splashy kind that makes you feel like a kid playing around. We ran together for a while until we came to the bridle trail again. Margo pulled ahead after the aid station and would stay ahead the rest of the day despite having just ran the Little Rock Marathon last weekend. What a strong lady. As we ran down the hill to began the Sycamore Trail I told Tony, that I would not be trying for a fast time today. He agreed that the pace should have felt a lot easier than it did so we would just try to have fun and get in a good workout. I figured as lousy as I'd run in the past I could just take it easy and still end up with a course PR at least. So for the next couple of hours we would just cruise along having fun and greeting friends on the out and back sections. We were separated for about a mile on the North Turkey Creek Trail as I was walking faster than Tony and he decided to let me go. But I was in no hurry and soon he caught back up to me. It was while he was behind me that I came into the most interesting aid station of the day. Several young ladies were dressed up in evening dresses and had a Prom theme. One of the signs said to kiss the Prom Queen and not being a guy that can turn down a chance to kiss a pretty young girl, I took her up on the offer. They all got very excited and said I was the first person to actually get a kiss. Makes me wonder what's wrong with all the other guys. Well, I guess some of them Are married. By the time we came off Turkey Creek I was pretty much toast. I was tired and moving slow and with another 10 miles to go I was afraid it would be a long day. At least I could still get that course pr if I just kept moving. Not. I was well hydrated and had taken in plenty of calories but it was just not to be today. By the time we began the climb up the Cedar Ridge Trail it was obvious that even beating last years time would not be happening today. Very disappointing but at least it would soon be over. Ended up in 4:43:35, about 6 minutes slower than last year. But within a few minutes I was smiling again and enjoying the company of many MTC friends in the Lodge. Tony announced our plan to return next year and run under 4hours. I said I think instead I'm going to give up this long distance stuff and go back to running 5K's . Slowly. Yeah right. See you at the 100 miler in three weeks. Thanks to MTC member Ron Horton for the photos. Here is a link to the one he took. And here is his race report with even more photos.